Baking soda is known for its deodorizing properties, so sprinkle a little in your shoes the night before you plan to wash to get a fully fresh scent the next day. Before putting your shoes in the washing machine, remove the laces and put them in a laundry bag, or a pillow case if you don’t have one. Take the insoles out as well and hand wash those. If you want to avoid DFW washing machine repair, don’t skip this step! Before you ever put your sneakers in the washing machine, get an old toothbrush or other soft bristled brush and scrub any caked dirt or debris off of the shoes. Otherwise, that debris may end up clogging your washing machine and creating costly issues. Now it’s time to begin the wash! Throw your tennis shoes in a laundry bag, then place in the washing machine with a few old towels to muffle the banging and clunking in the washing machine. 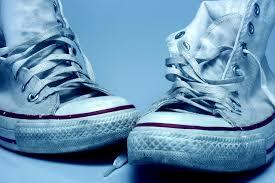 The laundry bag is necessary to prevent the shoes from causing any damage to the washing drum. Add adequate liquid detergent for your load, then run the delicate cycle with cold water. Important tip: never use powdered detergent for washing tennis shoes in the washing machine, as it can get caked up in the shoes. This is the most tedious part! In order to get those tennis shoes looking brand new and avoid shrinkage or warping, do not put the tennis shoes in the dryer. Instead, just set them out to air dry. As always, if you ever suspect issues with your washing machine and need washing machine repair, call the #1 appliance repair company in DFW, Appliance Rescue Service. It’s easy to over think an appliance repair! Before doing anything else, be sure to check to make sure nothing is unplugged, circuit breaker isn’t tripped, filters aren’t clogged, and that the unit hasn’t overheated. After checking all of the obvious sources of issues, move to the moving parts. As these are constantly in motion - think fan blades or motors – there is a much higher chance that something might need to be replaced there. If it’s not the motors and fans, then another common culprit is the hose. Dishwashers, refrigerators, and washing machines are all notorious for having leaks or issues with the hoses. Wall ovens, dishwashers, microwaves, and even washing machines may give you an error code. When you see these codes pop up, just google it! Type in the make, model, and error code and let the interwebs tell you what’s going on. It will help you understand whether or not the issue is something you can fix on your own. Not sure whether or not you should attempt to fix the appliance? Here’s a good rule of thumb: if the appliance is older than 50% of its average lifespan – and the repairs will cost over 50% of the cost of a new one – just buy a new appliance. Hopefully, these tips help you with your next diy appliance repair, but if not, know that the experts at Appliance Rescue Service in Dallas, Texas are always on hand to help! Give us a call with all of your Dallas appliance repair needs!